A good Beer is a good Beer ...and a good Distro is a good Distro! 5 openSUSE: it's more than a product! We at openSUSE believe that you get the best results when people collaborate in a fun and relaxed atmosphere. That is what we try to create at the openSUSE Conference and other events. And, like most Free Software events, we have discovered that beer is quite helpful in bringing these two requirements to life. The new label expands the size of the openSUSE logo and made the background colors more vibrant. While the label changed, the beer has the same great taste. At FOSDEM2016, the openSUSE Beer changed its The Open Build Service Beer label to a newer label highlighting some of the several openSUSE projects like OBS, YaST, Factory and Tumbleweed. The second version of the openSUSE Beer was released in 2015 in at FOSDEM, we introduced The Open Build Service Beer. Again, a local brew makes for a great fit with openSUSE. 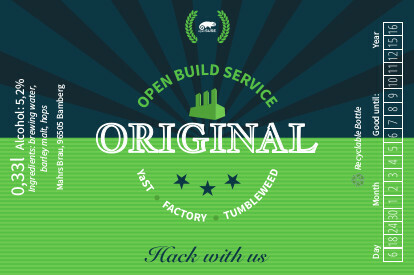 The latest openSUSE beer has the Open Build Service logo. Many people at FOSDEM said it's a great beer. We completely agree. The beer was brewed at Mahr's Brau in Bamberg, Germany. Many people consider Bamberg to be the Beer Capital of the World because it has more breweries per square kilometer than anywhere else in the world. The region north of Nuremberg, called Oberfranken (Upper Franconian), has the highest density of breweries in the world. Most of these breweries are operated as family business like Mahr's Brau. The Open Build Service Beer is brewed at the Mahr's Brau, which is 35 minutes north of Nuremberg. The history of this Kieler Bier (Lager) at Mahr's Brau dates back 1610. The brewery today is led by Stephan Michael whose family owned it since 1895. “Men’s Journal” in the U.S. honors Mahr's Brau as the “Best Brewery in the World”. The Open Build Service Beer is a kieler beer brewed with local ingredients and follows the German Reinheitsgebot. 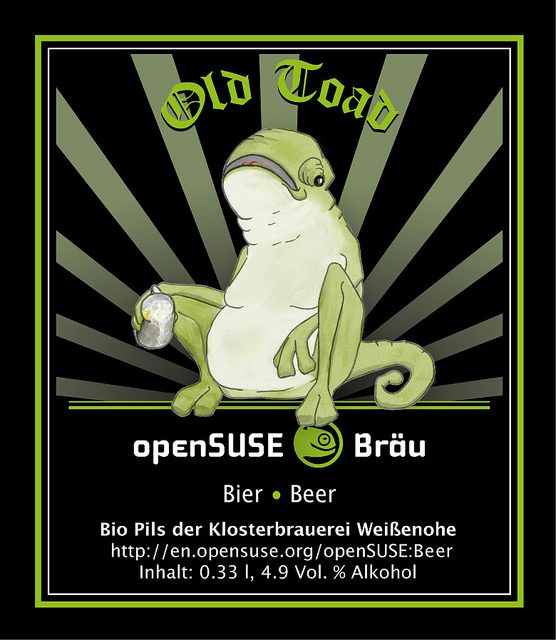 So, at the second openSUSE conference in 2010 in Nürnberg, Germany, we introduced Old Toad. This local bio micro-brew makes for a great fit with openSUSE. The region around Nuremberg, called the Fränkische Schweiz (Franconian Switzerland), where SUSE and later openSUSE were born, is said to be the area with the highest density of breweries in the world. Most of these breweries are micro breweries, operated as family business, with longstanding secret recipes for non-mainstream products. Often, they live together with a little restaurant where the beer is served with local food. In fact, these breweries compete with a predominant food industry and have to make use of their niche with a concept where premium quality of the products is the key. Just as we compete with a predominant software industry and have to make use of our niche with a concept where premium quality of the products is the key! Old Toad is brewed at the Klosterbrauerei Weißenohe, which happens to be in a village in the south of the Franconian Switzerland, 25 km north from Nuremberg. The history of beer brewing at that place started in 1050 when a Benedictine Monastery was founded. Today, the brewery is led by Katharina and Urban Winkler whose family owns it in the fifth generation, starting in 1827. The brewery offers a variety of Franconian beers. 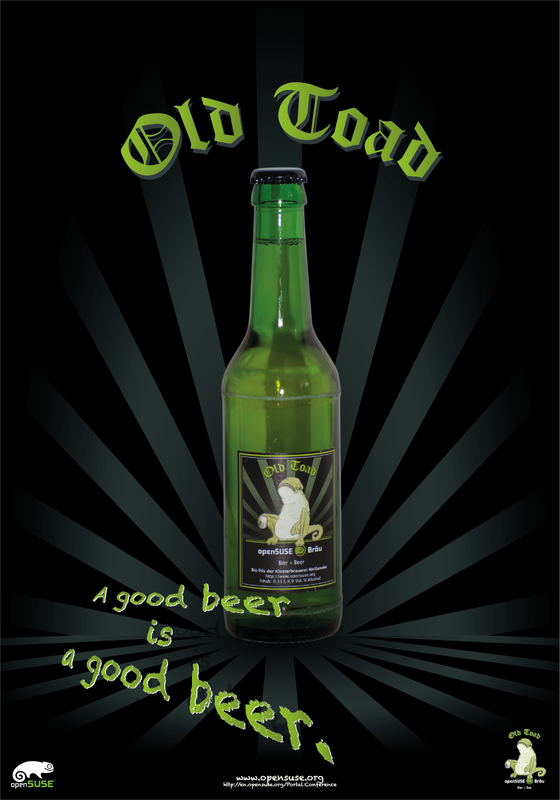 Old Toad in fact is their Pilsener beer brewed in organic quality with local ingredients, of course following the German Reinheitsgebot. openSUSE: it's more than a product! This page was last modified on 11 February 2016, at 08:28.